Did you watch the Grammys? Yeah me neither, but following the live blogs is just as entertaining, if not more so. The big story was Adele’s sweep, winning Album of the Year with her transcendent breakup album 21, and Record of the Year and Song of the Year with 2011 staple “Rolling In the Deep.” Kudos to the Grammys for getting something right, but they’re known to make some pretty laughable choices, and not even so much relating to what they pick as to how they pick them. Let’s go over some of the notable winners–ridiculous, deserving, and otherwise. Are you kidding me? Bon Iver made the big time last year with the self-titled Bon Iver, his sophomore album. Key word though: sophomore. Bon Iver’s debut record For Emma, Forever Ago was incredible, one of the best of the last decade. Oh, did I say “last decade?” Yeah, it was self-released in 2007 (before making a wider release the year after). I love the audacity they have to not just nominate him but choose him as the best new artist simply because those fossils finally recognized him. I know I’m belaboring an obvious point, but humor me for a second–take the Shins, for example. They made their last album in 2007, the same year as For Emma. The Shins are finally coming out with a new disc this year and we’re lauding them for “[taking] back their throne”, after “a long hiatus“. If the time between 2007 and now is “a long hiatus,” then I’m baffled as to how Bon Iver, around since 2007, is a new artist. (Btw in my opinion, the award should have gone to Nicki Minaj). Say what you will about Kanye’s persona (Insert “I’mma let you finish” dig here), but the man is a genius. 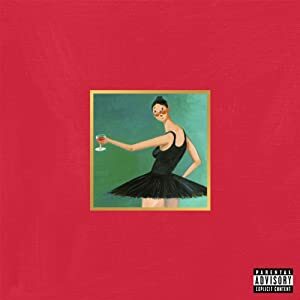 MBDTF rightfully won as the best rap album, but it’s insane that it wasn’t nominated for Album of the Year. Bruno Mars was nominated. Yeah, Bruno Mars. Badly done, Grammys. Badly done. OK I’m bored. I was thinking of writing more, but the Grammys are useless anyway. If you’re feeling in the mood to reminisce on the best of this year’s show though, just crack out the Adele, Bon Iver, Kanye, and Foo Fighters and have at it.